Have a Cooking Adventure for your Birthday! We bring the cooking adventure to your party! You choose a theme (scroll down for themes) and click the purple button to reserve the date . We'll be in touch to work out the details. When it's party time, we'll arrive 30 minutes before the party begins to set up. When the guests arrive, the cooking adventure begins! 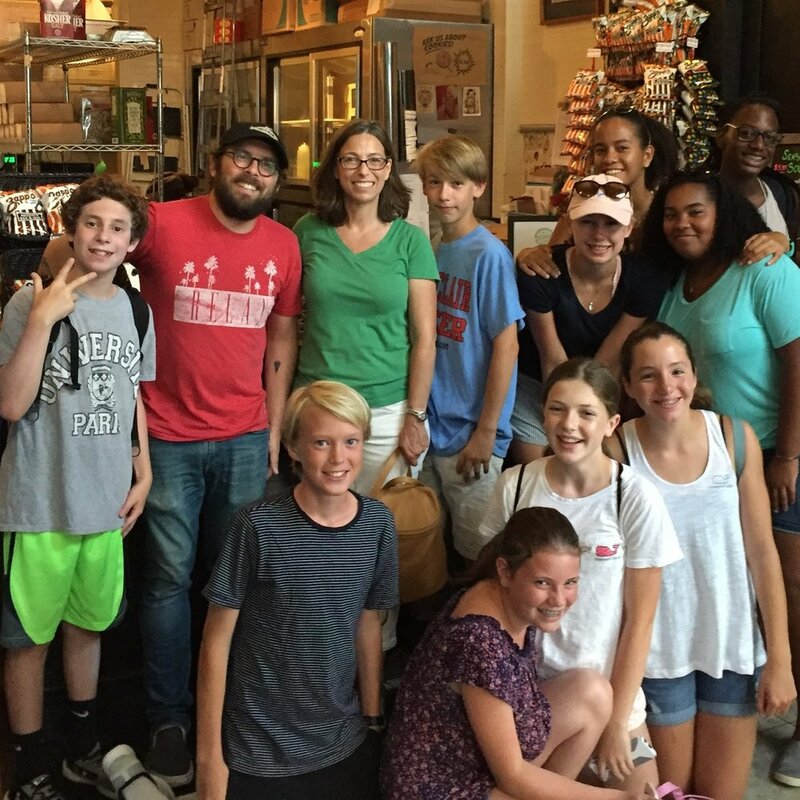 Party packages are flexible and fun for all kinds of kids, ages 5-17. Parties are designed to take about 2 hours. We bring all food, supplies, paper plates and utensils, and we handle setup and cleanup. => We'll send the invitations for you! An Adventure Kitchen apron of their choice to keep! We'll bring the apron gift-wrapped to the party. You may choose to have your child's apron embroidered with their name for an additional $10. We'll reach out to confirm all the details. The kids work together (just like the Baudelaires) to make a big batch of Puttanesca Sauce following our recipe, which we based on the description in Book 1 of the series. The kids also work together to make Esme Squalor's Salmon Puffs while sipping acqueous martinis in fancy glasses (adults: no alcohol, but let us know if you'd like to skip these anyway), just like they served in Book 6. We bring all food and supplies. Kids will use vegetables and other ingredients to make Anxious Clown faces (like this one). Then, they'll use alphabet pasta noodles to write the names of their clowns and (for older kids) create anagram aliases for their clowns. An Unfortunate Escape Kit bag containing peppermint candies, a mustache disguise and a desperate letter from Aunt Josephine (like this one) which either contains a secret message or an inordinate number of grammatical errors for no reason. Plus, a copy of our recipe for Pasta Puttanesca. Not-for-Olaf Raspberry Cupcakes shown with Lemony-Basil Buttercream frosting (or choose Vanilla Buttercream if you prefer). Cupcakes are naturally pink from raspberry puree! Or choose Uncle Monty's Coconut Cream Cupcakes based on this recipe if you prefer (also yummy!). > Add Not-For-Olaf Pink Raspberry Cupcakes for $35/dozen Our original recipe, freshly baked just for your party, based on this recipe. (Read this post for more info.) Choose Lemony-Basil Buttercream Frosting (delicious and guaranteed to keep Olaf away) or Vanilla Buttercream Frosting. We'll also bring the candles! > Add Uncle Monty's Coconut Cream cupcakes for $35/dozen Our original recipe, freshly baked just for your party, based on this recipe. (Read this post for more info.) We'll also bring the candles! And at the end of the party, we'll present our gift to the birthday boy/girl: the Adventure Kitchen apron of their choice! Let us know if you'd like us to personalize your child's apron with her/his name embroidered for $10. Perfect for: soy-free, peanut-free and nut-free. Dairy-free without cupcakes. If you require gluten-free: skip the cupcakes and we'll be happy to sub gluten-free pasta of your choice. See notes at the bottom of this page about food allergies and sensitivities. 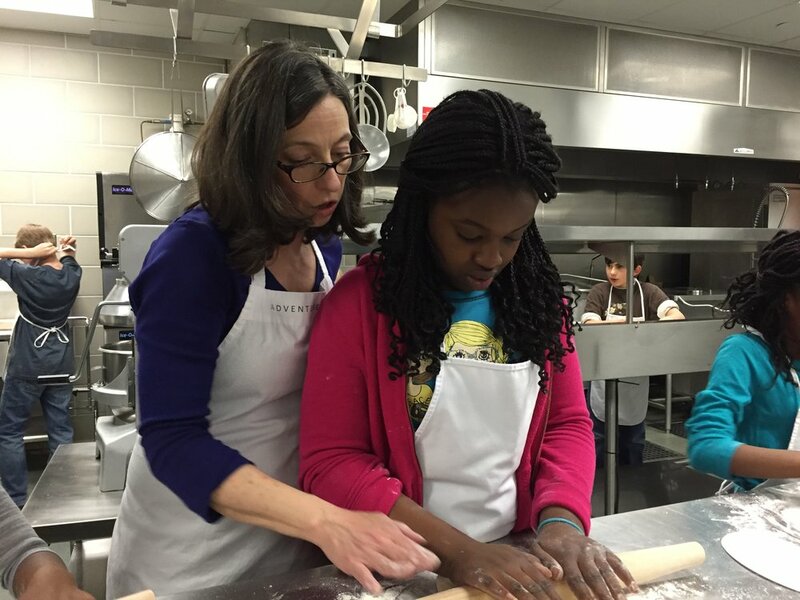 We bring homemade pie crust dough and teach the kids how to roll it out. Teams work together to choose ingredients and make their own unique filling. We'll use the extra dough to make Pie Crust Cookies. The winning team will be chosen based on taste, presentation, teamwork and overall team awesomeness. While the galettes are baking, each team will work together on a Team Awesomeness Display, including a team logo, to be judged in the competition. Baking Fun Bag with a keepsake cookie-cutter and a copy of one of our galette recipes. Members of the winning team will also be presented with a small keepsake Silver Whisk of Awesomeness. 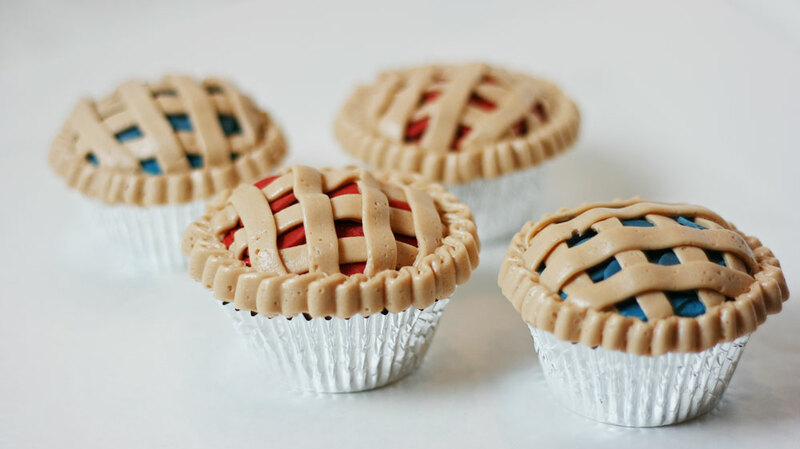 We'll decorate each cupcake to look like a pie, just like this! > Pie-Themed Cupcakes for $35/dozen We'll also bring the candles! And at the end of the party, we'll present our gift to the birthday boy/girl: an Adventure Kitchen apron of their choice! Let us know if you'd like us to personalize your child's apron with her/his name embroidered for $10. Perfect for: vegetarian, peanut-free; nut-free; soy-free. dairy-free without cupcakes. Sorry, this party is not gluten-free. See notes at the bottom of this page about food allergies and sensitivities. We bring Japanese pop music and everything else we need. Kids make sushi rolls and edamame, drink Japanese soda (optional, subject to availability) and make origami! We bring sushi rice, veggie fillings, seaweed wrappers and all other food and supplies. Kids work together to make edamame, then take turns using our sushi mats to roll their own sushi rolls. We supply chopsticks, sushi mats and all the food and supplies, and teach the kids how to roll their sushi and eat with chopsticks. Older kids are encouraged to cut their own sushi (with our close supervision). Older kids make an origami chopstick holder and possibly other origami as time permits. Younger kids make a Japanese flag. Sushi Fun Bag with a keepsake pair of authentic Japanese chopsticks, along with their completed craft and a copy of our sushi recipe. We'll decorate cupcakes to look like emoji faces, like these! > Emoji-Face Cupcakes for $35/dozen We'll also bring the candles! Perfect for: vegetarian; peanut-free; nut-free. Dairy-free and gluten-free without cupcakes. Sorry, this party is not recommended for soy-free. See notes at the bottom of this page about food allergies and sensitivities. We bring Mexican party music and everything else we need. Kids make veggie tacos, refried beans, guacamole and pico de gallo, and make Mexican party candle holders! We bring corn tortillas, veggie fillings and all other ingredients. The kids mash beans into refried beans and make guacamole and pico de gallo, then make their own tacos. We bring all food and supplies. Kids make a luminaria or candle holder in a skull (Dia de los Muertos) or Mexican Flag design. Fiesta Fun Bag with a battery-operated votive candle and their completed luminaria/candle holder to take home, along with a copy of our guacamole recipe. We'll decorate cupcakes with buttercream frosting to look like cactuses, just like these! > Add Cactus Cupcakes for $35/dozen We'll also bring the candles! > Add Decorate-Your-Own Cactus Cupcakes for $5/child ($50 minimum) We'll bring cupcakes and our homemade buttercream frosting and teach the kids how to decorate their own cupcakes. Decorating cupcakes is fun :) and will add about 30 minutes to the length of your party. > Add Mexican Hot Chocolate (not spicy) for $30 (serves up to 12) A traditional part of Mexican celebrations! We'll bring the Mexican chocolate, milk (lactose-free upon request), and include the kids in making the hot chocolate. We'll teach them the traditional Mexican "bate bate chocolate!" song as we froth the chocolate with an authentic wooden molinillo. We'll serve it the traditional Mexican way, with froth on top. > Add a Pinata for $45 Just like a real Mexican celebration! We'll bring a Mexican-style pinata full of candy with a string to hang it, as well as a blindfold and decorative bat, and bags for the kids to put their candy in. We'll safely lead the kids in taking turns hitting the pinata until it breaks open with candy for everyone. (If you prefer a pinata with a pull-string, please let us know.) A pinata is super fun :) and will add about 30 minutes to the length of your party. Perfect for: vegetarian, soy-free. Gluten-free and dairy-free without cupcakes. Dairy-free, peanut-free and nut-free without hot chocolate. See notes at the bottom of this page about food allergies and sensitivities. We are very knowledgeable about food allergies and sensitivities, and we take them very seriously! However, please know that the prep kitchens we use are not allergen-free. We are an adventurous cooking business and we regularly cook with all kinds of ingredients. Although we take precautions to prevent cross-contamination, there is always a small risk. If you are uncomfortable with this, then an Adventure Kitchen birthday party is not for you (unfortunately!). We encourage kids to try new things in a fun and age-appropriate way! This may include working with many kinds of kitchen tools, and for kids 10 and up, working with knives under close supervision. We also encourage but never require kids to smell, touch and taste lots of things that may be unfamiliar to them, or that they may be wary of. It's all part of the adventure! If you have any questions or concerns about this for your particular situation, please reach out. We want to create a party that you and your child will both love! Lynley Jones, creator and owner of Adventure Kitchen. Hey there, I'm Lynley! I'm the owner and creator of Adventure Kitchen, and I'm a mom and a curious cook (just like you!). I started this business so I could have fun with food, and I think it would be super fun to have fun together with you on your special day. Depending on the size of your party, I usually bring an assistant. We take care of all the setup and cleanup, we wash the dishes. And we're really fun! If you have any questions or want to talk about anything, please reach out anytime! You can email me directly at lynley@adventurekitchen.com.